This is the Q Page of our A to Z guide to plants -- how to care for them, landscaping with them, and cooking and healing with them. 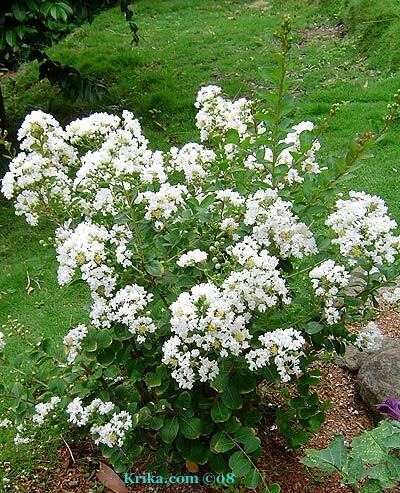 With its dark green leaves the flowers on this small normally fifteen foot tall tree or shrub really stand out. 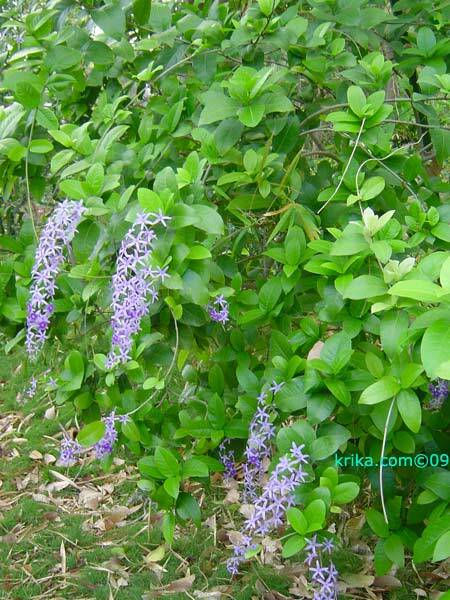 It requires full sun to flower most abundantly with its delicate, frilly, light purple/lavender or white blossoms, but it will also flower in a bright semi-shady area. 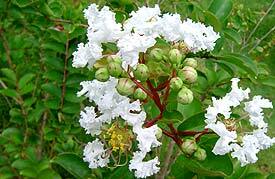 Benefits: Crape Myrtle has medicinal applications and its wood is said to be useful as well. 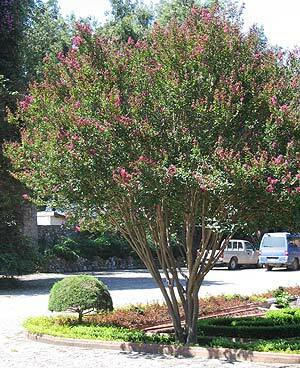 From: Originating in South East Asia and Northern Australia, crape myrtle is now widely spread around the globe. Photographed: At our former home in Montserrat unless otherwise noted. 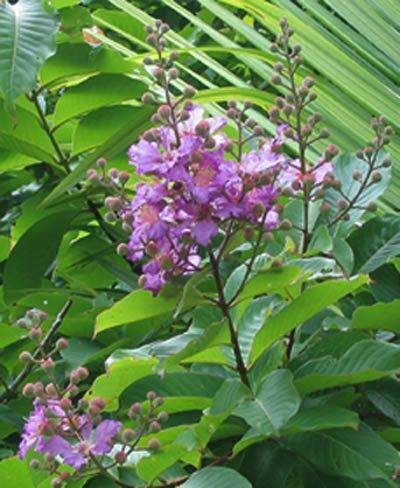 Planting and Care: In the gardens at our former home in Montserrat, we had good luck with our crape myrtles planted in a sunny area where they normally bloomed for months on end beginning sometime in June. We then planted them as part of a hedge in full shade and after several months they are finally began thrive; they are even flowered. I read somewhere that providing lots of moisture to young plants greatly speeds their growth and it's true based on what we've seen; older established plants do just fine with whatever rainfall comes their way. To stimulate production of new flower stems, cut off the old ones; it not only works to bring more flowers, but the bush itself seems enhanced. 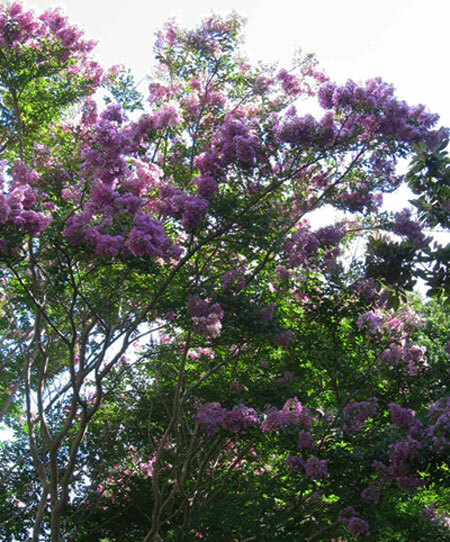 This too is really a crape myrtle, but may be another variety. The ones we had on our property in Montserrat never gave an indication that they would grow into small trees, but that may be because I pruned them frequently. 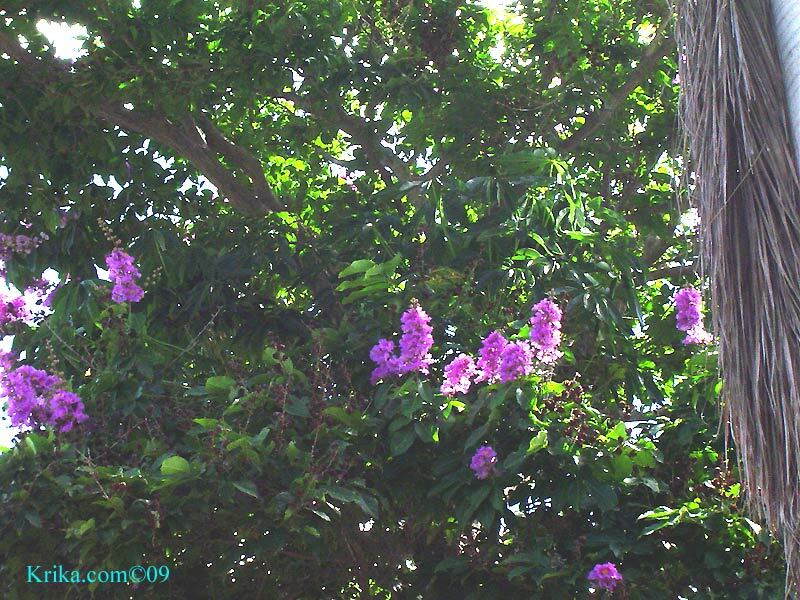 As a small tree, growing only to be about twenty feet tall, it is so beautiful that when I saw it while driving to a friend's house in Montserrat I just stopped the car and took the picture below on the right. The owner's of the property where it was photographed have two extremely vicious dogs free to roam the neighborhood and attack at will. I had only a moment to take the picture and close the car window before they reached and leaped at the car snarling and snapping their jaws. Benefits: The leaves and roots are said to have medicinal benefits which may include treatments for stomach problems. By some it is said to be used as a natural treatment for diabetes and by the ever hopeful as an enhancement to weight loss. Planting and Care: Full sun and routinely receiving a moderate amount of water will keep the queens flower healthy for years and in bloom for more than a few months every summer. It is considered sub tropical and can handle temperatures in the 30's F. on occasion. Planted in a tropical or non-freezing environment the umbrella tree will excel, growing to be about twenty five feet tall and spreading about half as much. This is one very tough and attractive small tree; it is used as potted indoor greenery in many northern climate office buildings and as a house plant by many northerly gardening enthusiasts, but it only achieves its true self planted outside in the sun. Benefits: This small tree has been a part of traditional medicine for a very long time with its stem, leaves and roots all finding themselves useful in healing. Photographed: I don't have one as yet, but I'm working on it. Planting and care: The umbrella tree will handle a shady spot, but much prefers to be planted in the sun. 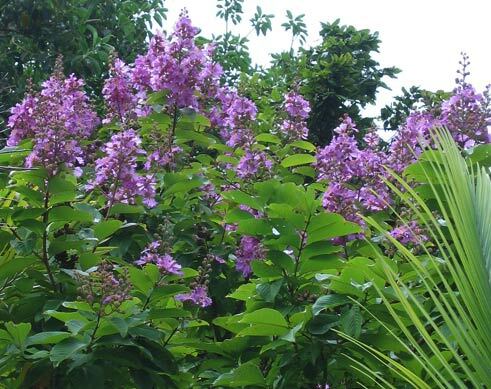 It likes good soil and good drainage to be at its best and it is tropical in nature. This is the vine-like bush that lived under and in and around the branches of our red flamboyant tree in Montserrat. The papery leaves are pretty and its long sprays of blue flowers are really lovely. 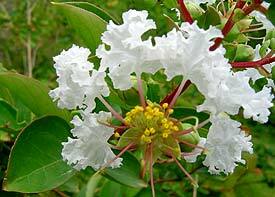 Benefits: It is known to have been used medicinally, but I don't know for what disorders. From: It originated in the West Indies and the Tropical Americas. 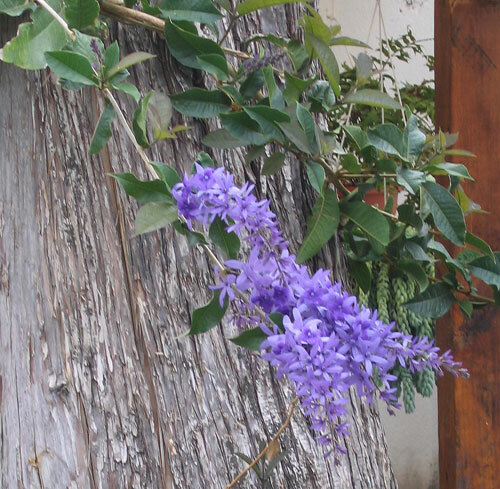 Pruning: Petrea will take very well to a hard pruning as we discovered one year. One of ours had grown completely out of control and had attached itself in an unattractive way to our bamboo. I cut it back severely and in short order it was bushy and beautiful. I would recommend doing this sometime during rainy season or at a time when you will be watering. 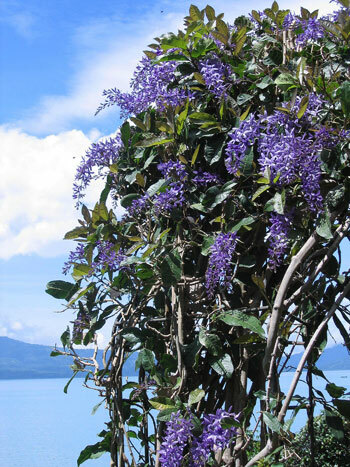 Landscape architecture: Petrea is a wonderful tropical cousin to the appearance of a wisteria vine in the north. 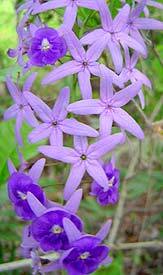 It can be trained to a trellis in much the same way although sadly its similar flowers don't have any noticeable scent. at Lake Atitlan in Guatemala in 2015. 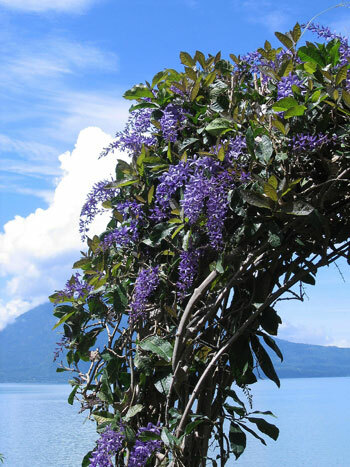 Photographed: In the garden overlooking Lake Atitlan at the Hotel Atitlan in Panajachel, Solala, Guatemala.